i used to be an avid coffee drinker. in my hay day it was light and sweet, i moved on to skim milk and some shuga for a little sweetness, i even experimented with the soy milks and the lattes and the whatever else they can concoct with that coffee/espresso bean… but with the revelation of the melness bringing to light allergies to milk, soy and nuts, it kinda put the kebosh on picking up coffee at the cute shops all over town… until the day they discover how wonderful it would be to stock coconut milk! so over the past few months it has been herbal teas front running my morning beverage routine. ive written about my love of tea before, but this time id like to break down just how beneficial herbal teas can be for you and your loved ones health. first of all, lets set the record straight – not all teas are created equal! the leaves from black, green and red teas come from the Camellia Sinensis tree. now dont get me wrong – black, green and red teas are still great for you, as they contain polyphenols, which serve as antioxidants to protect the body from free radical damage. through several studies, these tea polyphenols have shown to provide anti-cancer properties. what we call ‘herbal teas‘ don’t come from this tree at all. actually, an herbal tea is really an infusion called a ‘tisane‘ which is made from various herbs, flowers, roots, and other plant parts. peeps have been using this plant food as an herbal remedy for thousands of years! sarsaparilla – promote energy and healthy skin. these are just a handful of the many, many options there are out there. even better are the herbal tea mixes that put a little bit o’ this and a little bit o’ that together to become an awesome source of healing goodness. anyways, this really got me thinking. i like it a lot and could totally relate this to what i am kinda doing here – loving, serving and uplifting – SCORE!! 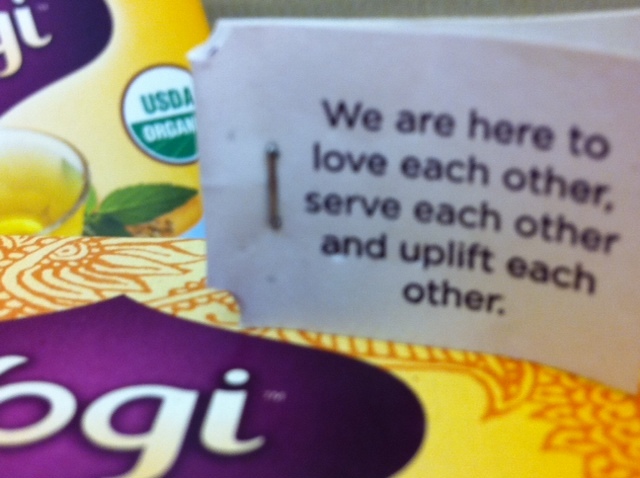 so with sticking to the mantra, i’ll love, serve and uplift others today by telling you about this wonderful Yogi tea goodness that i hope you will enjoy just as much as i. when you do get to that soothing cup, i hope your special quote makes you think twice too! i started drinking Yogi teas (in addition to the various other brands i like) about a year ago when i discovered the echinacea immune support kind at my local foodstore. cold season was underway and i was doing everything in my power to not catch the sickness everyone else around me seemed to have. be it first thing in the morning or all the way to the last soothing cup before bed, this tea is great any time of the day and is packed with tasty, all natural herbs and well wishes. i have also tried their stomach ease and bedtime kinds, equally as tasty – they even have an entire line just for the ladies, talk about girl power! grab a box of this goodness next time you are at the store, i mean c’mon, they are created with mood, flavor and purpose in mind, how could you resist something like that afterall? !